Concrete settling and sinking is quite common. It occurs when the soil, at the time of installation, was not compacted properly, or when water runoff is not channeled properly. Concrete sinking may also happen due to the simple natural settling of earth over time. 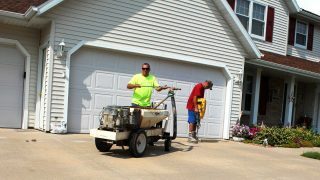 Concrete lifting is the process of filling the voids under concrete, which results in the lifting of the concrete slab. It is simple math. Concrete contractors must make up to three trips to a location to replace a simple slab of concrete with removal, framing, pouring, removal of framing material and cutting. Add to this the ever growing problem of environmental constraints of concrete disposal: the replacement of a simple 10’x10’ piece of driveway, walkway, or pool deck can cost upwards of a $1000. Raising & Stabilizing: Polyurethane concrete raising and mudjacking are two methods used to raise and support sunken concrete or unstable concrete slabs by drilling holes and pumping material under the slab. Settled concrete is commonly a result of poor soil conditions below a slab. HMI products are industry-leading, long lasting, and reliable. You can put your trust in HMI. Home » Concrete Raising » Mudjacking » What is Mudjacking Concrete Lifting?